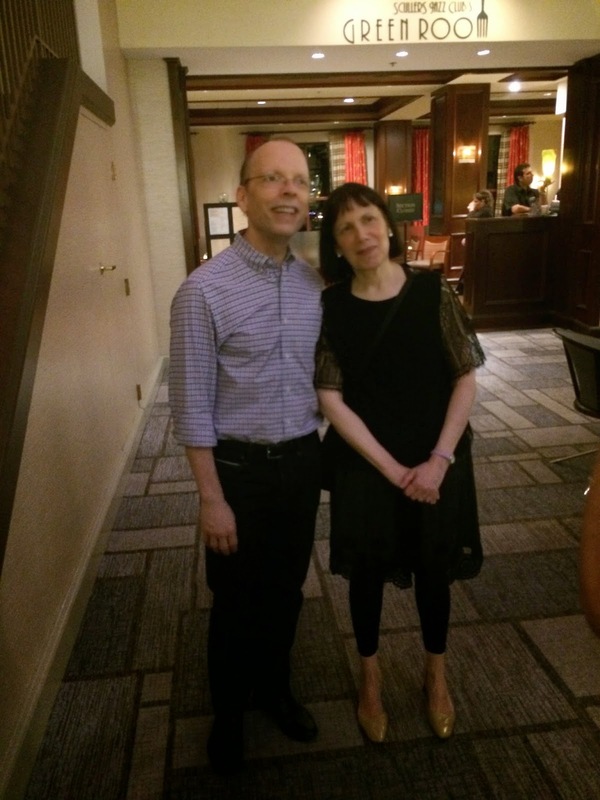 This past Wednesday, August 27 I went to Scullers to see the pianist Leslie Pinchik perform with her trio at Scullers Jazz Club in Cambridge. Pintchik's trio consists of Scott Hardy on bass and Michael Sarin on drums. This concert showcased music from Pintchik's new release, "In the Nature of Things." Listen to Pintchick's trio play "Luscious" here. Pintchik started the concert with "Overeasy", which features catchy melodic statements repeated to form a cohesive sound. Hardy, Pitnchick's husband, often sang while he was soloing; this got me to thinking what comes first, the singing or the note on the bass? The next piece, "Luscious" could be described as mood music in the way that its coolness emanated across the club. Each song seemed to focus on a pulsating rhythm, with a laid back yet forward propelling beat. I enjoyed the way Hardy on bass and Sarin on drums comped in order to bring out the natural line in Pintchik's playing. Pintchik amused the audience by recounting a documentary she watched on the dust bowl, and how the grass that makes tumbleweed was one of the only things that could actually grow in those conditions. Pintchik named her own composition "Tumbleweed" to correlate with the way that the song 'rolls around and changes key'. Sarin provided counterintuitive drum hits, creating a sense of surprise. Pintchik's strong point is in her time feel, and the way she can manipulate the beat in order to shape a phrase. Pintchik's piano touch is light and understated, and she playfully mixes melodic single voice lines with denser chords to create contrast within a phrase. Though her sound is calming, her rhythmic feel is driving. In addition, Pintchik's compositions are laid back and understated, yet they have a twist full of polyrhythms, shifting harmonies, repeated motivic elements, and trio interaction to provide the underlying excitement that could be forgotten in 'cooler' sorts of jazz. "Sparkle" was an audience favorite, which was Pintchik's reflection of a club she worked at. Just like the title would guess, this song was full of energy and pizazz, and was more up tempo, featuring spontaneous drum crashes, and open sounding chords. "Let's Get Lucky" featured Hardy's pulsing rhythmic drive upfront, bringing in cursing drums, and a fluid piano, changing moods frequently through use of dynamic contrast. Pintchik chose "For All We Know" because of her love of the profound lyrics. Through use of this ballad, Pintchik's trio illustrated honesty in their playing, showing sincerity in their faces. Pintchick's two hand technique on the piano created thoughtful countermelodies, creating an internal conversation to match the subject matter of the piece. I could follow the logic of every solo, with a clear focus to melody, rhythm, and energy development. "Terse Tune" ended 'with a wimber, not a bang'. This tune showcased Pintchik's humorous, lighthearted personality and Pintchik claimed her trio provides the 'colors of an orchestra'. "How About You" highlighted the trio playing conversational, bluesy lines, with Sarin stretching the time. The next song, "I'd Turn Back if I Were You", 'has to do with a career in the arts' snickered Pintchik. The song reminded me of the Danny Fox Trio and the Bad Plus, which I have seen recently. "Completely" was a subtle tune which led into the last song, "There You Go". The phrase, 'there you go' can be used as either a way of agreeing or disagreeing, which was showcased in the way the trio acted with and against each other in a humorous, playful fashion. My taste in jazz is very much dependent on my sort of mood. Sometimes all I want to listen to is the loud thrashing of Albert Ayler, and sometimes all I can stand is the calm sounds of Chet Baker- but it is all jazz. Pintchik's show at Scullers 'In the Nature of Things' came at a time when its subtlety and nuance calmed my spirits. Check out my new jazz poetry blog, Without a Poem!